Veteran character actor Andreas Katsulas died earlier this week from lung cancer; he was 59 years old. 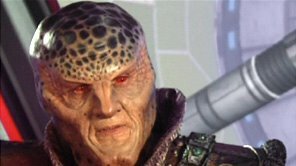 To genre fans Katsulas is best known as the character G’Kar for five seasons on the classic sci-fi series Babylon 5. He also created another memorable character on Star Trek: The Next Generation as the Romulan Tomalak. Katsulas possessed a grand dramatic voice and was a fine actor. He will be missed.